The City of Lakewood held a free, educational, three-hour class Saturday July 23rd, with an emphasis on smart gardening, having a great looking yard while using less water, energy and conserving resources. This is the first in a yearlong series of educational workshops to be held at the Weingart Senior Center stressing the importance of drought gardening. This free, educational program was held to improve resident’s knowledge of smart gardening, being water resourceful and improving everyone’s green thumb and lawn. Close to home, the Lakewood-based Water Replenishment District (WRD) offers several free water-wise eco-gardener classes to aid residents in saving water and improving their garden. Students become familiar with irrigation basics, best horticultural practices, drought tolerant native plants and garden design concepts. Several handouts were given to attendees on California Friendly Landscape Design, Sprinkler to Drip Retrofit, Central Basin Grant Projects, How to Make a Rain Garden, Constructing a Site Plan, and Residential Rebates Information. 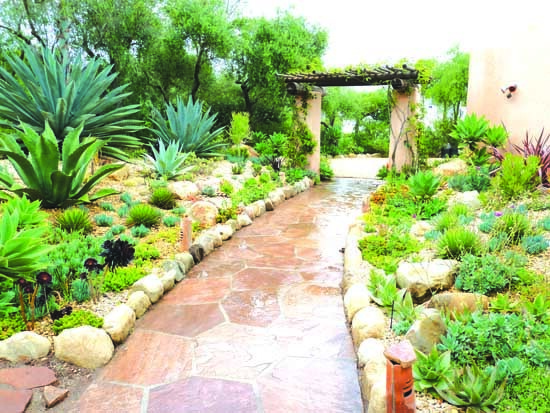 Among some of the more interesting and useful information included the six elements of a proper California friendly landscape. When planning your garden, take a watershed approach. A natural watershed is a balanced sustainable system. Conservation is a particularly important water resource for Southern California as it reduces demand on our imported supplies. Understanding native plants and grasses is imperative to creating a sustainable, yet beautiful landscape. Build up your soil. A healthy soil will soak up rainwater and will be rich in nutrients; it also needs a balance of oxygen, water and microorganisms. Build up your soil with compost and soil amendments to help retain water, which you can do by aerating and feeding the soil microbes. Familiarize yourself with compost. Believe it or not healthy compost smells good. Landscape experts suggest a compost tea, continually mulching bare soil and grasscycle, which is simply leaving the clipping on the lawn after it has been mowed. Finding drought tolerant California natives that are pleasing to the eye are becoming more prevalent at home centers and plant nurseries. Native or Mediterranean plants are California friendly and thrive in our climate. They also invite pollinators that are good for edible gardens. Use rainwater as a resource. Instead of letting rainwater drain off your property, find way to slow it, spread it and sink it. According to Skelton for a 1,000 sq ft roof, 1-inch of rain equals 600 gallons of fresh water for your garden. Collecting rainwater in a barrel and redirecting drain spouts is an easy way of capturing this precious resource. Many cities offer barrel incentives and adding a rain chain is a beautiful and functional alternative to traditional, closed gutter down spouts. Guiding rain water visibly down chains or cups from the roof to the ground, can transform a plain gutter downspout into a pleasing water feature. Lastly manage your irrigation. Check the soil to see if it is dry, turn on the watering system and check the components, consider converting from a spray to a drip of fixed spray, turn back your irrigation and check your local irrigations rules and regulations. California is a dry climate, we are in a drought and fires are raging across our state. But we can still have a beautiful garden and lawn with a little bit of good sense and safe planning. Close to home, the Lakewood-based Water Replenishment District (WRD) offers several free water-wise classes. Learn more about the program by emailing [email protected] or call Monica Serrano at 562-275-4234. City of Cerritos | Free landscape plans and horticulture plant pallet.